Over a year ago, more than 90 percent of Qatar’s food was imported, with produce coming from surrounding GCC countries such as the United Arab Emirates and Saudi Arabia. However, on June 5, 2017, a number of Qatar’s neighboring states suddenly and unexpectedly cut diplomatic ties, a turn of events that had the potential to affect the day-to-day lives of Qatar’s residents severely. Within weeks, however, new international partnerships and channels of distribution had been formed to address the country’s immediate needs. By August 2017, His Highness Sheikh Tamim bin Hamad Al Thani was calling for greater food self-sufficiency for Qatar’s long-term sustainability and independence. Sahtak Awalan has enabled students to contribute to Qatar’s sustainability goals. In a nationwide effort to help the country, a number of organizations answered the call, launching innovative food security programs. Qur’anic Botanic Garden (QBG), a member of Qatar Foundation, successfully established an ambitious program for high school students designed to promote the value of food sustainability. 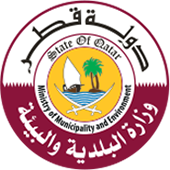 As part of the ongoing program, students attend workshops at QBG and learn from experts from the Ministry of Municipality and Environment and the private sector. Participants are also given the opportunity to meet with local businesspeople who work within the food industry to learn about the challenges and obstacles that they face on a day-to-day basis. Additionally, QBG houses a small-scale farm on-site at Education City, growing a variety of fruits, vegetables, and herbs, including tomatoes, onions, garlic, parsley, and dill—enabling students to learn first-hand how to cultivate produce. “We discovered that many young people, and high school students in particular, don’t know much about agriculture, and their knowledge of the importance of food security is limited. Therefore, the main aim of this program is to provide basic information to students and equip them with the practical skills to help grow the domestic agriculture industry. Ultimately, through this initiative, we are investing in the future of Qatar,” said Fatima Saleh Al-Khulaifi, project manager at QBG. The greenhouses are run by professional gardeners. WCM-Q, a QF partner university, is another entity working towards food sustainability. Project: Greenhouse, part of WCM-Q’s Sahtak Awalan – Your Health First campaign, aims to teach children about the environment, sustainability, how to grow fruits and vegetables, and the importance of adopting a healthy diet. So far, WCM-Q has provided greenhouses to more than 130 public elementary schools across Qatar, as well as seeds, soil, and instructions on how to cultivate plants. In February 2018, Project: Greenhouse expanded to include a brand-new initiative, Khayr Qatarna, which is helping promote food security and self-sufficiency in Qatar by installing three large-scale, climate-controlled greenhouses at select schools. 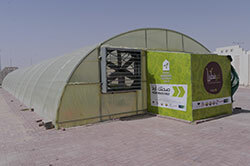 These greenhouses, run by professional gardeners, are being used to grow fruits and vegetables for distribution through local supermarkets under the Khayr Qatarna brand, with all proceeds being reinvested into the project. As the project continues to develop, WCM-Q aims to include additional schools and build more greenhouses, with the possibility of increasing the range of fruits and vegetables that are grown. 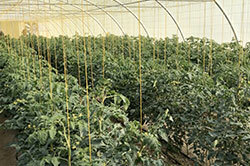 All proceeds from the Khayr Qatarna greenhouses are reinvested in the project. Commenting on the program, Nesreen M. Al Rifai, chief communications officer at WCM-Q, said: “The concept of food sustainability and food security is vital for Qatar. If there is one positive aspect of the blockade, it has provided Qatar with the impetus to take responsibility for its own food production. Khayr Qatarna wants to complement this, providing the community with fresh, locally-grown food sold under the Khayr Qatarna brand and also allowing our children to take a role in the nation’s food security. In November 2017, QF also launched Torba Farmers Market in Education City. The market is a Qatari-founded initiative that provides access to organic, locally-grown food, and homemade products, and supports agricultural and other food producers around the country. The market runs throughout the winter months.